Access the step-by-step curriculum to learn the Water Fund development process. 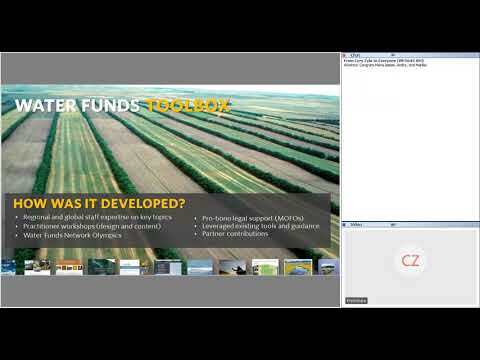 What is the Water Funds Training? The Water Funds Training provides practitioners with an innovative approach for learning the process for developing and implementing a Water Fund. This Training combines both online and in-person engagements to equip students with an understanding of key concepts related to Water Funds and stepwise guidance for completing each phase of the Water Funds Project Cycle. What are the goals of the Water Funds Training? By offering a best practices approach, a key goal of the Water Funds Training is to build the capacity of local and regional Water Funds practitioners to scope, design, create, operate, and monitor Water Funds. This Training aims to achieve this goal by providing a structured, multi-faceted approach that combines stepwise guidance with applied examples, coaching support, and a peer-learning environment. Access the self-paced training today! Learn about past Water Funds Trainings and what to expect. Watch this webinar to learn more about the WF training and lessons learned from applying it.